“Everyone can draw!" This was my response to someone who claimed she could not draw anything. The discussion began during a weekly meeting of our local art group when a visitor looked over my shoulder at a graphite portrait I was finishing. She said "I wish I could draw but I'm hopeless - I can't even draw a straight line or a circle". She said it with such a pleading voice that I felt compelled to offer a helping hand to explore how she could use her inherent latent skills to get started. I explained that it's not necessary to be able to do everything free-hand. Many artists use simple tools and techniques to make life easier, for example You don't need be able to draw a perfectly straight line - anything that has a straight edge can be employed such as a ruler, the side of a box or a book, even the side of a pencil.It’s not how you do it – it’s the end result that matters! In landscapes there are few perfectly straight lines other than shafts of light, horizons on water or man-made objects. Often there is a need for a circular or oval shape but not always with crisp edges. Some other tools to use here can be compasses, plastic templates, coins, cups, tin lids etc – but most times a perfect crisp sharp edged circle is not required more likely a generally roundish shape will do. We often have skills and abilities that can be adapted - if you can stir a cup of tea or a pot of soup you are able to make circles - maybe not perfect circles but nevertheless rounded shapes. In drawing it is all about the confidence to make marks – and the more we do it the better we get! Art is a personal expression; we do it firstly for our own enjoyment - if someone else likes what we have done that is a bonus. When I finished this simple demonstration a number of friends asked if I could set up a workshop to help them develop their skills - so now we have regular workshops. At my age I find it extremely usefull to reflect on experiences developed over a lifetime of creativity - looking back on ideas and techniques that developed through academic enquiry as well as trial and error. Experiential learning is extremely powerful but most of us will not live long enough to experience everything so we should draw lessons from other peoples expeiences. In these workshops I'll attempt to draw together learning experiences to develop artistic skills. So let’s start by exploring some capabilities. First, like in any physical activity, we should do some limbering up exercises. The shapes we make are influenced by our bone structures, sinews and muscles - so some gentle hand and arm flexing and stretching exercises help. I usually start with by rotating my shoulders 5 or 6 times, then holding my arms out horizontally make 6 clockwise rotations of my hands followed by 6 anticlockwise. I then flex my fingers and thumbs to loosen all joints as best I can for half a minute – this avoids any jerks from clicking joints or ligaments when attempting fine lines. That’s when I feel ready to start! 1. Place a blank page of drawing paper flat on a table. 2. Take a new soft lead pencil (B3 – B6) and hold it like you would hold a teaspoon. 3. Rest your elbow on the table so that your hand is over the centre of the paper. 4. Now place the point gently on the paper and draw 2 small circles approx 3/4cm diameter and 3/4cm apart, do this by using a stirring motion with your finger and thumb like you do when you stir a cup of tea. All the time keeping your elbow still. 5. Now without moving your elbow draw a third 3/4cm circle just below the centre of the first two. 6. Still with your elbow on the same spot, draw a larger circle about 10/14cm diameter around the others – this time like you are stirring a pot of soup. 7. Now draw a 5/8cm curved line underneath the bottom 3/4cm circle, about halfway between it and the bottom of the outside circle. 8. Finally draw a couple of large black dots in the first two 3/4cm circles and you should see a funny face looking out. Try this exercise a few times speeding up each time – you should see your lines getting smoother and rounder the more often you do it. Try changing the shapes a bit making the small circles bigger, oval, pear shaped, try angling the shapes inwards or outwards. Make the black dots bigger/smaller, towards the centre or to one side. You can add ears, some hair and eyebrows – have fun creating cartoon faces. We started by drawing a series of 12 circles: these looked just flat discs. Next we began drawing straight and curved lines - this began to make the flat discs look more like balls. 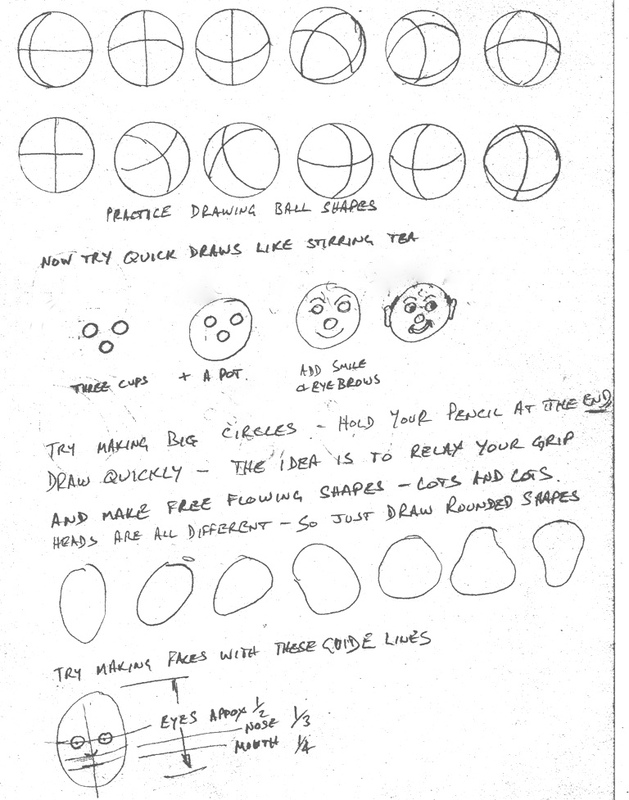 After drawing the small circles we moved to drawing large circles as fast as possible - the shapes became smoother but not always round - this didn't matter as the objective was to get people who had been afraid to draw to start making marks without fear of criticism. This exercise is designed to show the importance of using the natural radius created by the flexibility our finger and wrist joints, and how using anchor points it can help to control smooth movements that cannot often be achieved by depending solely on upper arm and wrist muscles when drawing. By anchoring the elbow on the table then using only finger and wrist articulation it is possible to maintain control over the generation of curves and thus reduce shakiness. I’ll show you how I adopt variations of this technique in the following workshops along with diagrams and images. Artists make continuous series of adjustments to images, both major and minor, while completing works – it is not always possible to get it right the first time – so don’t be afraid to erase and overdraw to adjust images until you are happy with the outcome. By lightly applying soft lead pencils or charcoal it is possible to modify shapes with erasers and blenders until the desired image emerges. If the lead is not pressed hard into the grain of the paper it is easily removed, but if it is pressed hard the grains of lead or charcoal get trapped in the tiny pores of the paper making it near impossible to erase without damaging the surface. Art is a language, where ideas are transformed into images that are interpreted by the viewer, just like spoken languages there are many variations, sometimes viewers just don't get the message but others happily do, don’t be afraid to show your ideas. I hope that you found something of interest here. Please feel free to comment or ask questions, you can reach me at dimaart44@gmail.com or on Facebook on the Dima Arte page. Art is a continuous learning experience – a journey not a destination.